Paul Virilio, culture theorist, architect, claustrophobe and asthmatic, sits high on the ridge, communing with the supernatural and looking down on the herd below. He sniffs the wind, scouts the boundaries, stares into a wide open sky that’s blue as the eyes of the white-boy Jesus. His brow furrows. There’s been poison all along, and some of it has got into the herd. So what is Virilio so upset about that he has to put pen to paper in Art and Fear and Crepuscular Dawn. Who and what is causing le boeuf de Virilio? Well, it’s those pesky artists up to their no good tricks again. Not just any artist–Charlie Chaplin is good and Bob Dylan sets the toes a tapping in a wholesome sort of way, but Stelarc, Christian Boltanski, Meg Stuart, and even Rothko have been way too negative and transgressive for the old architect from Paris. Virilio senses that the absence of the body in Abstraction leads to the absence of the living body through suicide, and the distorted images of the body in Expressionism encourage the torturer to distort the body of the victim. 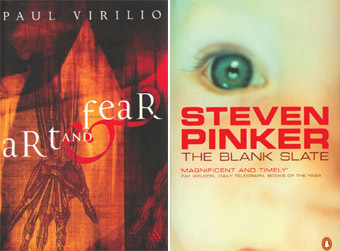 It’s the slippery slope argument, and for Virilio that slope leads art down into suicide, torture and genocide, so that “The slogan of the First Futurist Manifesto…led directly to the shower block of Auschwitz-Birkenau.” If he is right and art after Impressionism is responsible for all these things one wonders what the causes of suicide, torture, and genocide were during the long years before the twentieth century and in populations completely isolated from European art history. But it is probably unfair to subject Virilio’s writing to the light of evidence and the scrutiny of reason. Like a shock jock, Virilio is pissed off and he’s not going let the facts stop him telling us who is to blame for his fear and anger. In a sense Virilio is the last of the medieval men, a pre-Baconite who is quite happy to appeal to authority rather than evidence; to not talk about the world as an independent external, but the world as it makes him feel. Enough of art for the phenomenologist, what about art for the scientist? The problem there is that art has no obvious function yet appears to be universal so the hunt is on for why people spend an awful lot of time and energy doing something that apparently confers no benefit. Steven Pinker, cognitive neuroscientist (once MIT, now Harvard), has devoted a chapter of The Blank Slate to write about art as one of the adaptive strategies of an ape on the make. He’s not dogmatic about it, he knows we don’t know the adaptive value of art-making, but he’s willing to toss his hat in the ring and give it a try. For Pinker art is a by-product of the hunger for high status as indicated by doing things that have no overt value. The reasoning goes that if you can waste time in gratuitous displays of consumption or effort then you must be rich. And riches make for are an attractive mate. Creating and owning art, that item of gratuitous display, is therefore an indicator of high social status and high social status gets you a better class of root. More often and with more partners as well. Pinker also likes Ramachandran’s idea that there is an aesthetic pleasure in experiencing adaptive objects and environments–art tunes you into the best bits of the environment and lets you know that your cognitive perceptual apparatus is working. It does seem that people prefer some images over others and that this may relate to ancestral environments and health. Komar and Melamid surveyed the art preference market worldwide and found strong commonalities across all the groups surveyed — people like pictures of comfy landscapes. Science-wise the same thing turns up: pictures of the savannah are good and if the time of the day is sunset then people like the picture to show somewhere safe to shelter for the night as well. As far as images of people go, it’s healthy over sick – and happy over sad – every time. Usual limitations of experiments though: average responses, very constrained experimental conditions. In other contexts representations of all sorts of things–eg warnings — are important and valued as well. Pinker’s use of behavioural genetics and evolutionary psychology to shed light onto the existence and function of art production and consumption is pretty interesting. But then Pinker goes too far and claims it all went horribly wrong with modernism and post modernism. Artists stopped pandering to the evolutionary limits of perception and cognition. They stopped going for realism, started painting outside the lines, that jazz don’t swing no more and who can find a tune worth whistling. Besides, art theory is for wankers and nobody listens to the critics anyway. As is common in arguments touting the ‘Once was an age of gold but now is in an age of mud’ theme, there is a whole lot of edited highlights of history going on. Pinker has found a bunch of art that doesn’t communicate to him and then generalised that to elite art doesn’t communicate to anyone worth knowing because elite artists flout evolutionary constraints on communication. He has oozed over from science to taste without noticing the transition. (Pinker here differs from Virilio who thinks that a similar set of artworks do communicate but the result of this communication is profoundly negative). Well, using 10 or so individuals to represent the activities of millions people over hundreds (or thousands) of years doesn’t make for a very compelling critique. Rather than think of art as a set of objects or practices in some edited highlights package–Constable is in and good, Stelarc is in and bad, Mum’s not in even though she paints all the time–art practice can be seen within the broader context of the production and exchange of representations. That is, art can be discussed within the framework of cognitive neuroscience without rejecting modernism, post-modernism, or any other -ism. We are the animal that represents. Our social lives are built upon representations and our brains are hard-wired to make them. On the left hand side of your head and a tad inside the skull from the temple are the mirror neurons–the part of the brain responsible for imitation of biological motion. It’s still early days in understanding mirror neuron function but it seems that if you watch someone move the mirror neurons in your brain will light up just as if you were making that motion yourself. More abstractly just the trace of a movement, or its sound, will trigger the same reaction from the brain. So mirror neurons provide evidence of a neural mechanism for exchanging representations via sight and sound. Feel the passion in those brush strokes, hear the emotion as that voice catches. Meaning, at least in part, comes by mapping the trace of someone else’s motor behaviour onto a memory of your own internal states when you made similar movements. Art practice can be seen as a component within the exchange of representations. The dominant social practice is to transmit core representations–representations that are read immediately by many–and most art has this function. However art also has an exploratory function within the space of all possible representations – from an evolutionary perspective it is adaptive for the group to have a representation space available that allows for understanding the present environment whilst also being able to represent possible environments. Such a system makes the group robust in the face of environmental change. Innovative art practice can then be interpreted as a claim for the necessity to foreground new representational parameters, such as chance events, abstract forms, and biological systems, or as a claim that areas of the existing representation space are under-explored or under-represented within the core. It is inevitable that most explorations will end in failure–if the world is changing in unexpected ways then some artworks will get the future right and others will not. And artworks that were once radical explorations can become core if the changed circumstances they represent lock in over time. Pinker, and to a lesser extent Virilio, confuse art that deals with core representations as indicative or prescriptive of art as a whole. It is inevitable that many of the modernist and post modernist works they dislike will fade into obscurity along with most of the works of any period. However that does not mean that the enterprise of modernism and postmodernism is a failure. It may be that the space of representations coming out of a collaborative research group like SymbioticA, or being explored by artists like Stelarc, Meg Stuart and Orlan does not prove fruitful. In science that is known as a negative finding— showing what doesn’t work. Whilst a negative finding is not as exciting as a positive one, it does have value—like finding that a particular supermarket is crap so you never have to go there again. However, these or other artists will almost inevitably provide positive findings—representations whose ability to trigger meaning generalises out to a larger population.